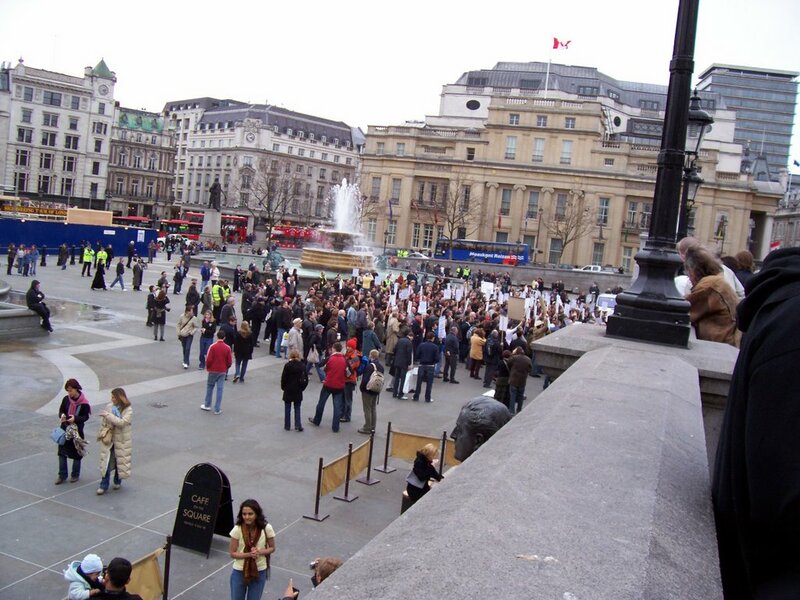 ON SATURDAY 25 March 2006 a campaign calling itself the “March for Free Expression” (MFE) held a widely publicised demonstration in Trafalgar Square. The protest was primarily motivated by the desire to express solidarity with the right-wing Danish paper Jyllands-Posten over its provocative decision to publish offensive, and in some cases blatantly racist, anti-Muslim cartoons. Although the organisers stated piously that it would be “a march in favour of free expression, not a march against Muslims”, the actions and political records of the participants belied their public denials of anti-Muslim bigotry. The main instigator and organiser of the March for Free Expression was a computer consultant from Cambridge named Peter Risdon, who runs a blog called FreeBornJohn. Another blogger, who might have been expected to sympathise with the aims of the MFE, observed about Risdon: “He describes himself as a ‘libertarian’, but his blog comes across as hard line English right wing nationalist, with a blanket anti-Muslim stance.” Among its list of recommended links, Risdon’s blog prominently features such hard-right Islamophobic websites as Jihad Watch, Little Green Footballs, Steyn Online, Gates of Vienna and Western Resistance. Risdon commented that “it is always good to read any prose, however tactless, that derives from a time when people felt able to say what they actually thought about cultures different to their own”. Risdon also posted a link to a website selling t-shirts that featured slogans such as “Get your fatwa out of my face. Support Denmark. Support free speech”, “Up yours, ‘religion of peace’!”, “Viking jihad” and “Islam is a blast”. One of the official sponsors of the “March for Free Expression” was the Freedom Association, whose campaign director Mark Wallace was a platform speaker at the Trafalgar Square rally. This organisation gained notoriety in the 1970s for its energetic defence of the “freedom” of Grunwicks to oppress and exploit its employees without interference from the trade unions. Equally energetically, it has defended the right of racists to promote hostility towards minority ethnic communities. Another right-wing body sponsoring the March for Free Expression was the Libertarian Alliance, whose director Sean Gabb was a platform speaker at the Trafalgar Square rally. This is an organisation which issued a press release welcoming the acquittal of British National Party führer Nick Griffin and his sidekick Mark Collett on race-hate charges at Leeds Crown Court in February. Gabb was quoted as saying: “Doubtless, there are people who take offence at the expression of certain views on race and immigration. But free speech that does not include the right to give offence is not free speech.” The press release went on to reiterate the Libertarian Alliance’s demand that all legislation against racial hatred and discrimination should be repealed and that “the Commission for Racial Equality and all similar organisations should be abolished, and their records burned”. Also among the sponsors of the March for Free Expression were “several branches of UKIP”. Freedom Association chairman Christopher Gill, who so eloquently advocated the defence of “our” Anglo-Saxon society against dilution by non-white migrants, recently defected from the Conservative Party to UKIP – just after Tory leader David Cameron had attacked the latter as “closet racists”. This move was hardly surprising, since UKIP’s propaganda against immigration is virtually indistinguishable from that of the Freedom Association. Another organisation with a record of anti-migrant rhetoric that sponsored the MFE was the National Secular Society, whose director Keith Porteous Wood was a speaker at the rally. The NSS graphically illustrates the point made by Owen Jones, in the March 2006 issue of Labour Left Briefing, that “as anti-Semitism once clothed itself in the rhetoric of anti-capitalism, today Islamophobia appropriates the language of secularism”. An editorial on the NSS website responding to the Danish cartoons crisis was headed “Islamist steam roller attempts to flatten European free speech – it must not succeed”. The article outlined a “clash of civilisations” thesis and added that “these cartoons were published in Europe, where European values still have a precarious toehold”. “Precarious toehold”? What was that, other than an appeal to the racist myth that “western civilisation” is under threat from Muslim migration and population growth? The editorial went on to underline the theme of a threatened Islamicisation of the West by polemicising against “those who have attempted to import the values of Islam into our culture, and who constantly try to change the law to enforce those values”. The objective of reprinting the cartoons would be to “stand in unity with those who want to reinforce European enlightenment values”, the editorial stated. Quite how “enlightenment values” are served by publishing racist caricatures that portray Islam as a violent, barbaric and misogynistic religion, thereby feeding into and encouraging the widespread hostility towards Muslims that exists among Europe’s majority white community, was not explained. “the fastest-growing religion is Islam. Chillingly, it continues to grow like a canker, both through immigration and through … unrestrained and irresponsible breeding” … “for homosexuals, it is doubtful that there is any such thing as a ‘moderate’ practising Muslim, or that the Koran can be regarded as anything more than just a squalid murder manual” … “it is not racist to be anti-immigration or anti-Islam” … “the reckless and mismanaged immigration polices of successive governments have led to the demographics of our major towns and cites being for ever changed by huge numbers of foreign settlers” … “Legal or illegal, many of these Third World and Eastern European newcomers are criminals of the worst kind, and many more are hopelessly ill equipped to live in a complex Western democracy, unable even to speak English in some cases. A parasitic few are bent on the destruction of Western civilisation” … “Redundant churches are sprouting onion domes and minarets. We are becoming strangers in our own land” … “In the Netherlands, the warnings of popular gay politician Pim Fortuyn were tragically snuffed out by a left-wing assassin before he could sufficiently alert people to the damage the influx of Muslims is doing to his own native land”. However, George Broadhead, who found the concepts “Islamophobia” and “moderate Muslim” so annoying, remains chair of the GALHA committee. The more overt racists may have left, but GALHA plainly has not rid itself of anti-Muslim bigotry. The only speaker at the Trafalgar Square demonstration from one of the major political parties was Liberal Democrat MP Evan Harris, who is an honorary associate of the National Secular Society and a vice-president of GALHA. During the controversy within GALHA over the anti-Muslim articles in Gay & Lesbian Humanist magazine, it was noteworthy that Harris failed to make a single public statement dissociating himself from the publication of this explicitly racist material. Harris has been the most vociferous British supporter of the French ban on wearing the hijab in state schools. He defended this disgraceful attack on the religious rights of young Muslim women as being “in keeping with centuries of secularism as far as state institutions are concerned in France”. When a radio interviewer asked him “is this ban not against the fundamental human right of freedom of religious practice?”, he replied, “no it isn’t because … schools are for learning not for practising religion”. This indeed proved to be the case. The government’s attempt to close a loophole in the law against inciting racial hatred, which has allowed the British National Party to stir up hatred against Muslims on the basis that they are not a mono-ethnic faith group, was vigorously opposed by Harris, who argued that it was “essential that we maintain free speech in discussing and criticising religious ideas, doctrines and practices”. He worked hard to sabotage the Racial and Religious Hatred Bill by means of an amendment drawn up by his fellow Liberal Democrat, Lord Lester, which had the effect of completely neutralising the legislation. As a result of Harris’s efforts, fascists can now continue to promote racial hatred under cover of attacks on Islam. No wonder some of them regard him as a bit of a hero. Perhaps the best-known speaker at the March for Free Expression was Peter Tatchell, of the gay rights organisation OutRage! Though Tatchell’s Islamophobia has become particularly obsessive in recent years, he has been promoting such views for a decade or more. In 1995 he published an article in Gay Timesentitled ‘Islamic fundamentalism in Britain’ which characteristically depicted Muslim communities not as potential allies in the struggle against discrimination but as an alien force threatening the liberal values of (white, non-Muslim) British society. Tatchell stated that the MCB opposed an equal age of consent, supported the retention of section 28 and opposed the right of lesbian and gay couples to adopt children – as indeed it did, along with leading representatives of other faiths, including the Catholic Church, Orthodox Judaism and Hinduism. Although Tatchell knows that perfectly well, he now tries to rewrite history and depict the MCB as being in an exclusive alliance with fellow “fundamentalists” on the Christian right. It is of course nonsense to suggest that the government fails to consult representative bodies on issues affecting the rights of women or the LGBT community. As for the MCB, it is consulted by Downing Street on the same basis as other faith groups. Tatchell’s accusation that the MCB is being given preferential treatment over non-Muslim organisations carries distinct echoes of a right-wing bigot insisting that non-whites enjoy favours when it comes to the allocation of jobs and housing. It cannot be argued that Tatchell is unaware of the representative character of the MCB. As we have seen, he describes it as “the umbrella organisation of all Muslim groups in this country”. Yet he characterises the MCB as part of the “global threat of ‘Islamo-fascism’” and says it poses an even greater threat than the BNP. When it comes to the BNP itself, Tatchell has done his best to undermine a united response to the fascist threat. In February 2006 he mounted a public attack on Unite Against Fascism for inviting the MCB to speak at its conference, which had been called to build a campaign against the BNP in the May local elections. The BNP had announced that it intended to make the elections a “referendum on Islam”, yet Tatchell seriously proposed that the MCB should be excluded from the platform on the grounds that its general secretary Iqbal Sacranie had made homophobic remarks during a radio interview. Another of the speakers at the Trafalgar Square rally was Maryam Namazie of the Worker Communist Party of Iran, an ultra-left sect notorious for its frothing-at-the-mouth Islamophobia. Not only does the WPI refuse to distinguish between various Islamist currents – all are denounced as terrorists committed to stoning adulterers, amputating limbs and beheading hostages – but the group’s blanket hatred of political Islamism extends to Islam as a religion, which is condemned for providing the ideological justification for terrorism and state oppression. Meanwhile, the real fascists were organising support for the Trafalgar Square rally at which Namazie was billed as a platform speaker. One supporter of the MFE later admitted that “the fascist connection snowballed and snowballed” as the campaign attracted those “for whom the free speech issue was just convenient cover for having a go at the Muslims”. This was hardly surprising, since the BNP’s line on the Jyllands-Posten controversy was little different from that of the MFE’s official sponsors. The BNP reproduced some of the cartoons on its website, explaining that it did so in defiance of those “who cannot tolerate important western democratic values such as freedom of speech, freedom of expression and those who fail to appreciate a sense of humour”. The fascists also used one of the cartoons – the caricature of the Prophet with a bomb as a turban – on a leaflet for the local election campaign, which the BNP announced they would turn into a “referendum on Islam”. The “brown far right” was a reference to the Muslim Action Committee, a broad-based organisation formed in response to the Danish cartoons crisis, which includes the liberal Muslim magazine Q News among its affiliates. Indeed, MAC took an extremely conciliatory line towards the March for Free Expression, emphasising that they supported free speech but attempying to convince the organisers that this principle should be balanced against the damage caused by encouraging bigotry against minority communities. Cohen’s ignorant attack on MAC echoed that of the BNP, who denounced the committee as “Islamo-fascists”. The IHRC pointed out that, earlier in the month, Muslim demonstrators had been arrested for carrying offensive and provocative placards protesting against the publication of the cartoons. The IHRC therefore called on its supporters “to contact the Metropolitan Police and the Mayor’s Office and ask that the law be implemented equally and that any demonstrators holding offensive and provocative placards and t-shirts be similarly arrested”. Furthermore, the advertisement for offensive anti-Muslim t-shirts was removed from the MFE site without explanation. Not only that, but Risdon declared that “Muslims are welcome” at Saturday’s protest. Whether the Metropolitan Police had a quiet word in his shell-like we do not know. However, the main cause of the retreat was apparently an intervention by Rend Shakir, a business acquaintance of Peter Risdon’s from Cambridge who had been proudly billed by Risdon as the March for Free Expression’s token Muslim speaker. Rend Shakir is the daughter of Samir Shakir Mahmood Sumaida’ie, a former Iraqi Communist Party member turned businessman who became minister of the interior in the puppet “Governing Council” in Iraq and is now Iraqi ambassador to the UN. Rend Shakir welcomed the invasion of Iraq – “I have seen Iraqis in this country struggle to swallow tears before speaking in public, saying things like ‘Thank you and thank your government for allowing me to speak freely’” – and she campaigned with the Organisation of Women’s Freedom in Iraq (a front for that country’s Worker Communist Party) against plans to incorporate aspects of sharia into Iraqi law (see the article ‘Stamping out Shar’ia’ in The Cambridge Student). She is even an admirer of Donald Rumsfeld! Not only was Rend Shakir unknown in Muslim communities but she was – to put it mildly – entirely unrepresentative of Muslim views. However, according to the Muslim Action Committee, Rend Shakir became “concerned about the tone that the March was taking and contacted MAC” – which was to her credit. She brokered discussions between Risdon and MAC, who pointed out to him that “placards depicting the cartoons would be an intimidation to Muslims and would perpetuate the BNP campaign that is very openly being conducted in the run up to the May local elections”. Presumably Risdon was faced with the prospect of his single, widely-advertised, Muslim speaker publicly breaking from his campaign, plus he was probably genuinely worried that the Trafalgar Square rally would be discredited by attracting large numbers of far-rightists and open racists – so he decided to cut his losses and accept a compromise. While most of the demonstrators adhered to Risdon’s call not to display the Danish cartoons, Reza Moradi – a member of the Worker Communist Party of Iran – turned up in Trafalgar Square brandishing a placard featuring some of the notorious caricatures. The examples he chose were the most explicitly racist of the series published by Jyllands-Posten: the one of the Prophet with a bomb as a turban and another of a wild-eyed Prophet wielding a knife, with two terrified veiled women cowering behind him – the implication of course being that Muslims are terrorists and misogynists. Just in case anyone missed the point, the latter cartoon was accompanied by the slogan “Religion – hands off women’s life”, implying that the oppression of women is intrinsic to Islam. “It’s my freedom, everyone’s freedom, to expose these pictures and encourage everyone to do the same”, New Humanist magazine, which was another of the MFE’s sponsors, reported Moradi as saying. In the rally’s opening speech, Moradi’s WPI comrade Maryam Namazie delivered a characteristically hysterical rant which featured the familiar WPI theme that political Islamism in all it variants is nothing but a murder machine inspired by the religion itself: “the political Islamic movement kills, it maims, it humiliates – with Islam as its banner – and we are not even allowed to ridicule and criticise it”. Namazie denied that Islamophobia was racism “because criticisms of a religion, idea, a belief and even the practices that result from beliefs – even a phobia and hatred against beliefs have nothing to do with racism against real live human beings”. According this reasoning, of course, the BNP are not racists, as they repeatedly declare that their campaign of hatred and bigotry is directed against Islam as a religion and not against Muslims as individuals. Namazie also delivered a second, impromptu speech after Moradi was temporarily detained by the police following a complaint about the placard he had brought. She addressed the demonstrators while brandishing the offending placard and then handed it to the crowd urging them to pass it round and display it. They were only too happy to oblige. Keith Porteous Wood of the National Secular Society asked rhetorically why the government had opposed freedom of expression by bringing forward the Racial and Religious Hatred Bill. He answered: “Perhaps a clue lies in the fact that just before the election the Home Secretary wrote to selected mosques … making the party political point that it was the opposition’s fault that the legislation had – at that stage – been rejected.” In other words, it was just an attempt to appease Muslims. The fact that the government had responded sympathetically to the concerns of Muslim communities was evidently reprehensible by definition as far as Wood was concerned. Peter Tatchell got a good reception when he attacked unnamed mainstream Muslim leaders for supposedly issuing death threats against a liberal imam who had been due to speak at his fundraising dinner the previous week, and when he criticised the police for failing to take action against Muslim extremists. One observer reported that Tatchell did leaven this with some progressive-sounding anti-racist rhetoric, “at which point he started to get heckles from people demanding that he stick to free speech, not go on about racism”. By the time Gabb got to speak, the demonstration had dwindled to about 150 rain-soaked reactionaries, as other protestors retreated to the local pubs. At its height, the crowd numbered no more that 350 – significantly less than the “thousands” confidently predicted by Tatchell a couple of days earlier. Some of the more mainstream defenders of “free expression” were no doubt put off by the likelihood of far right participation in the event and had stayed away. On the other hand, many of the racists who had initially been attracted to the protest had been antagonised by Risdon’s appeal not to display the cartoons and boycotted the event. Nevertheless, the organised far right did participate in the protest. The BNP reported that the demonstrators included “a delegation from Civil Liberty, the organisation established earlier this year to defend the rights of patriotic Britons…. About 40 CL supporters attended the protest rally and handed out literature which was well received by other defenders of our fundamental liberties.” The same claim was repeated on the Civil Liberty website, which published photographs of the demonstration. As a description of leftist criticisms of Tatchell’s participation in the MFE, this was certainly nonsense. In reality, our point was that Tatchell had entered into an alliance with right-wingers and racists in defence of the “freedom” to publish anti-Muslim caricatures, and that the MFE had consequently attracted the support and participation of the BNP. Tatchell, however, furiously denied that there was any far right involvement. “Contrary to the lies and scaremongering of the far left, there was no BNP presence at Saturday’s rally …”, he insisted. “There were no union jack flags, and no leaflets or placards attacking Muslims or promoting fascist ideas.” Tatchell’s lieutenant Brett Lock chimed in with the claims that “on the day, the BNP were nowhere in sight” and that the fascists “were explicitly banned from the march”. From which we can only conclude that leading members of OutRage! are in serious need of an eye test. Even leaving aside the fascists’ own admission that their members participated in the rally, photographers registered the presence of demonstrators waving union jacks and holding Civil Liberty propaganda. Moreover, the latter was openly distributed to the crowd without any interference by the stewards, notwithstanding Lock’s claim of a ban on the BNP. As for the placards attacking Muslims, they were also plainly in evidence – although, to be fair, it wasn’t the fascists of the BNP who brought them, but Tatchell’s allies in the Worker Communist Party. If in 2002 a bunch of right-wing “libertarians” had called a demonstration in support of the New Statesman’s decision to publish this anti-semitic illustration, with the declared aim of upholding the freedom to insult Britain’s Jewish community, would Tatchell, Harris, Namazie et al have participated? Would they have happily joined a crowd parading around Trafalgar Square brandishing placards featuring the NS front cover or a caricature of a hook-nosed Jew counting money, on the grounds that they were defending the basic democratic right to ridicule and offend? Would Nick Cohen have devoted a section of his Observer column to applauding the demonstration as a principled stand in support of free speech? These questions of course answer themselves. It should be obvious that the position of genuine leftists or liberals on the issue of free speech is fundamentally different from that of the political right, whether they are open Nazis like the BNP and Civil Liberty or non-fascist hard-right organisations like the Freedom Association and the Libertarian Alliance. For such organisations, “free expression” means the “liberty” to incite hatred and bigotry against minority communities and, more generally, to defend the “freedom” of the oppressor against the oppressed. In relation to racism in general all leftists and liberals would understand this point, but a number of them lose sight of it when the victims are Muslims. The irony here is that one of the repeated themes of the pro-war “left” – people like Nick Cohen or the neocon bloggers at Harry’s Place – has been to accuse the anti-war movement of being in a block with the “right”, by which they mean Muslim organisations. Yet they themselves evidently have no problem forming a block with the white Islamophobic right. Peter Tatchell declares unceasingly that in opposing war or fighting fascism it is permissible for the left to build alliances only with liberal Muslims. But when it is a question of attacking Islam he is happy to share a platform with the likes of Sean Gabb. Since the launch of the “war on terror”, the demonisation of Islam has become an important ideological weapon in justifying US attacks on majority-Muslim countries. It is evident that, under the impact of this imperialist propaganda, a section of liberal and “left” opinion has lost its political and moral bearings and is now prepared to form an anti-Muslim alliance with right-wingers and even outright racists. With US imperialism showing no sign of abandoning its programme of military aggression – at the time of writing, it has Iran firmly in its sights – exposing and combating this rotten alliance in all its forms, and defending Muslim communities against it, will remain a challenge for the real left for the foreseeable future. Next Post Will UKIP hurt Labour?